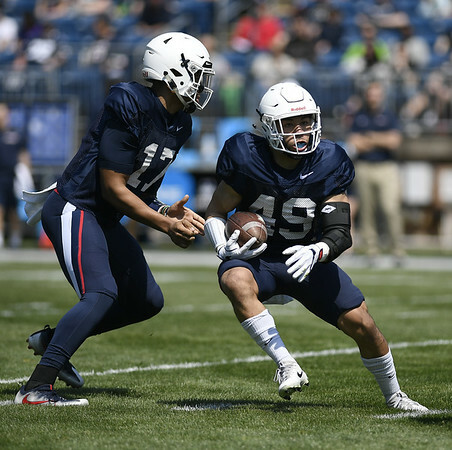 STORRS - Donevin O’Reilly’s hard work to make it this far in college football has made the UConn running back easy to root for. But fans of the Huskies, and the former walk-on from Glastonbury in particular, won’t get the chance to root for O’Reilly on the field this season. O’Reilly tore the ACL in his left knee in practice earlier in the week on Monday, ending the season for a man who only recently was awarded a scholarship and who very well may have been the Huskies’ starting tailback this season. O’Reilly joined the Huskies in Week 2 last season and played in two games in 2017, was participating in a non-contact, special teams drill when the injury occurred. He will have surgery Friday, coach Randy Edsall said. Edsall admitted that such situations “are the things you hate” about coaching football. O’Reilly began his college football career at Division II Merrimack before transferring to a community college and then to UConn. He did so with no guarantee of landing a spot on the Husky football team, but eventually did so through perseverance. “I remember running the hills next to our practice fields the whole duration of the practices back in 2016 when I wasn’t on the team … and just telling myself that I was going to go from being outside the fences to on the field with the team, with the eons who are now my brothers,” O’Reilly said. Combined with Nate Hopkins’ decision last week to transfer, the Huskies are suddenly shockingly short on running backs. Lavarey Banton, a 5-foot-10, 215-pound freshman from Hartford Public, was moved from linebacker to running back in order to add depth. Redshirt freshman Zavier Scott and sophomore Kevin Mensah are almost certain to get the bulk of the work this season in the UConn backfield. Mensah, however, was not thinking about moving up on the depth chart this week. “That’s like my brother. Seeing what happened to him, especially because we were just in practice, that really hurt a lot of us. A lot of us were crying and everything,” Mensah said of O’Reilly’s injury. And Mensah is sure that O’Reilly’s work ethic and ability won’t let this injury end his football career. Mensah, UConn’s leading rusher last year (561 yards) was suspended by the coaches for the bulk of spring practice for academic reasons but has seemingly earned much of their trust back since. Edsall praised Mensah for being “more mature” this summer. Posted in New Britain Herald, UConn on Thursday, 16 August 2018 21:16. Updated: Thursday, 16 August 2018 21:19.